In July and August of 2015, the City of Toronto will host the Pan American/Para-Pan American Games. In July, there will also be an economic and climate forum with world leaders in town for the games. Mining companies, politicians and corporations are all involved in the games and the economic and climate summits organized in tandem with them. Organizers from the Mining Injustice Solidarity Network will be working to highlight the unjust context in which these events will be happening. There are four main ways that we see this spectacle as connected to mining injustice. Firstly, Barrick Gold will be supplying the materials for athletes’ medals. 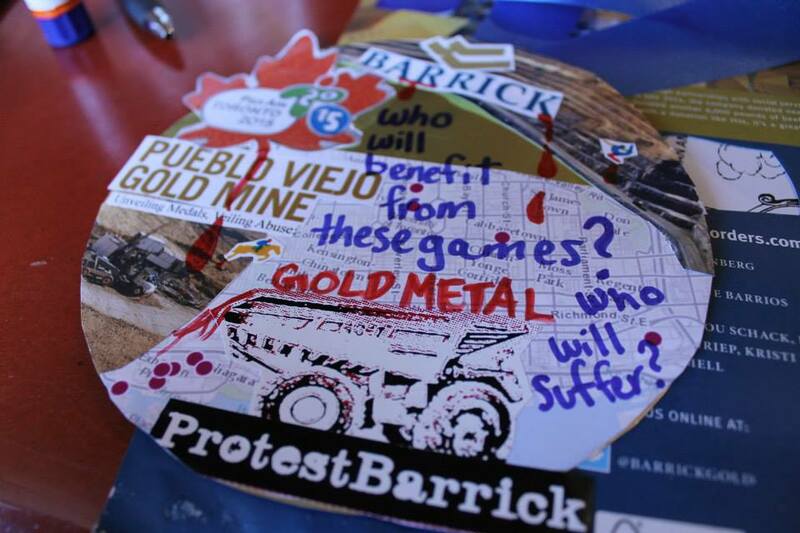 We have and will continue to organize around Barrick’s atrocious human rights and environmental record. The mines where the gold, silver and copper come from are highlighted here. Bad water quality, resulting in loss of agricultural land and negative health impacts, and the denial of impacted people’s right to self-determination are some of the major issues identified at these mines. Negative health impacts, repression, land theft and much more are endemic at Barrick’s mines around the Americas and the world. 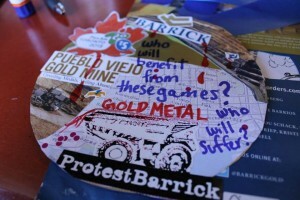 Sexual violence and murder are used as tools of repression by Barrick as well as other companies, making resistance to Canadian mining companies difficult and dangerous. Barrick is not a bad apple or exception, but is representative of the way the Canadian mining industry behaves. We feel that with Toronto centre-stage in the world for the Pan Am Games we have the opportunity to highlight these practices and the way that the Toronto Stock Exchange (TSX) facilitates them. 75% of the mining companies in the world are based in Canada, more specifically in downtown Toronto and Vancouver. Most trade on the TSX. In this context, local resistance to mining must be amplified where these companies are based and where the profits usually stay. Secondly, during the games there will be an economic and climate forum. This will bring world leaders together to make decisions that will impact all of our futures. These decisions will likely lead to the further impoverishment of marginalized people. According to their website “Heads of State, renowned economic thinkers and targeted CEO’s will be invited to attend and participate.” These same elites will be meeting to discuss the climate. We doubt that the voices of people from mining impacted communities will be represented at these summits of the Americas and that is unacceptable. Thirdly, we see parallels between mega-sporting events like Pan Am and mega-projects like mines. Both are explained using language of development and revitalization, but will actually magnify processes of displacement throughgentrification and land theft. Both bring further securitization and surveillance that stays in place when the mine or the games are done. Both happen in a context of social injustice. Of course, there are also specificities and differences that we do not wish to erase through making this connection. Lastly, we see our struggles as linked with local struggles that are impacted by these games. The Ontario Coalition Against Poverty has pointed to the large amount of public funds being used to support these games while these same funds are not spent on affordable housing. We recognize that although much of the wealth from resource extraction stays in the pockets of the elite in Toronto, this wealth is not spread evenly. Poor people everywhere are the ones who mining is least likely to benefit. These poor people are likely to be racialized, disabled, and otherwise marginalized. In this climate of austerity, it is ludicrous to be spending money on spectacles rather than shelter. These budgetary decisions illuminate the priorities of the state, as does the lack of accountability for mining companies. These games will also likely exploitmigrant labour. We see connections between displacement caused by Canadian mining companies and the exploitation and precarity of migrant labour. Cities and spectacles are built by migrants who are denied access to them; these migrants have often been displaced directly by Canada’s colonial and imperial behaviour which can be seen through the actions of its mining companies. These games are an opportunity to build a stronger movement in solidarity with people locally and across the Americas. Keep an eye on this page for more information about upcoming events and actions from MISN related to the Pan Am Games!